Fakenham Holt Road postmill was a small mill that was built with common sails to power 2 pairs of French burr stones and a flour mill. By the time the mill was dismantled in 1866 one pair of sails had been converted to William Cubitt's patent design and it is not known if the second pair was still being used. Millers. To be Let with Immediate Possession. A small POST WINDMILL in Fakenham with two pair of French Stones, flour mill with all apparatus complete. A single man with a small capital would find this an advantsageous occupation. 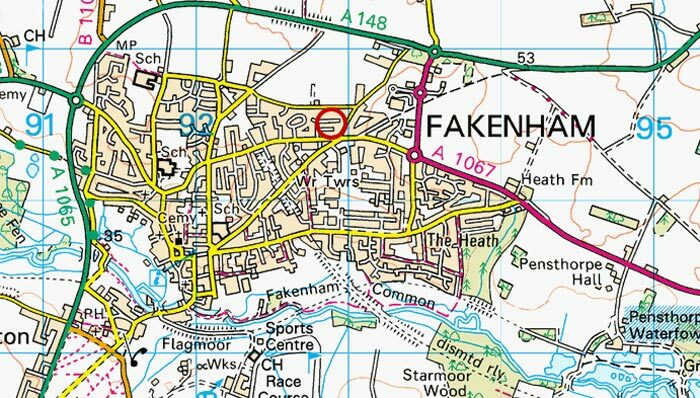 Apply to Mr. Joseph Readwin, Builder & Surveyor, Fakenham. A small POST WINDMILL with common sails driving two pairs of French Stones with Flour Machine, Sack Tackling etc. The Mill has not been built more than five years. Apply Mr. J. Readwin, builder & surveyor, Fakenham. To be Sold by Auction by R. J. Turner on Wednesday November 29, 1866 in the Timber Yard of Messtrs. Turner & Son's Buildings, Fakenham situate on the Holt Road, a Capital POST WINDMILL in Lots. One pair of Stones of excellent quality, new Head Wheels, two Patent Sails & other Fittings, all in good repair. Sale to commence at 2 o'c p.m.